One row of boa. Red laced body decorated with lots of opal stones and beads. 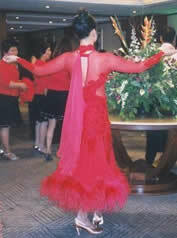 Long sleeves and waist-line in red net material, creating a slim look. 4-8, fits ladies up to 5’4” without shoes. Can easily adjust the length of the dress since it is removable. The dress is "removable" and can turn into a latin gown in just a few seconds. The dress comes with 2 chokers (both decorated with stones), one with float in orange-red.